Almost 10 years after we embarked on our journey to create the best possible antivirus product on earth, we have reached an important milestone. 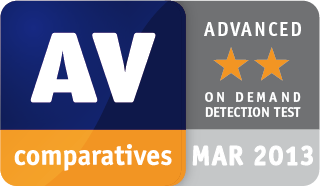 The renowned Austrian antivirus testing organization AV-Comparatives published the first real-world protection test in its 2013 test series. Emsisoft Anti-Malware celebrated its test debut with a perfect score – 100% infections prevented! The test included 422 live samples obtained by accessing websites that point to malware or use exploits to infect, as well as malicious email attachments. This provides a good overview of the typical everyday risks that users may face. While the software faced a number of low prevalence false positives, we believe that this is expected for an initial test and that we can rectify the issue in upcoming tests.